IN her heyday as the bejeweled empress of New York philanthropy, Brooke Astor entertained presidents, first ladies and a potpourri of pooh-bahs and literati at her elegant 14-room duplex on Park Avenue. 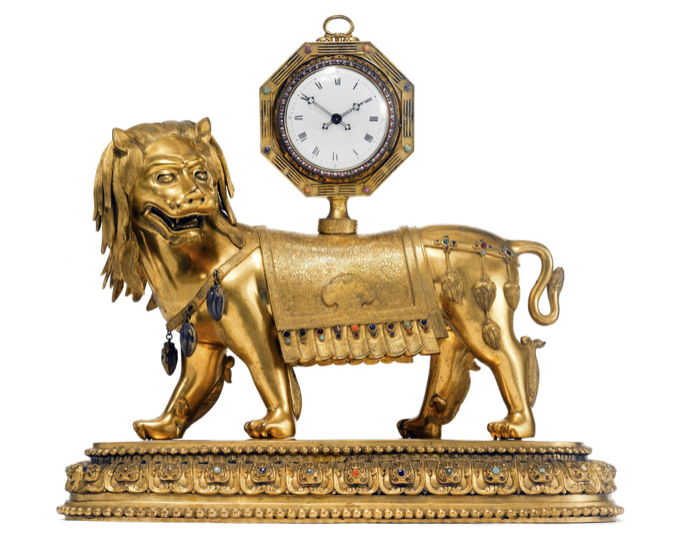 And when she died on Aug. 13, 2007, at Holly Hill, her estate in Westchester County, at 105, she left behind two households’ worth of cherished possessions, including Qing dynasty lacquer furniture, a jade-and-diamond Cartier clock and dozens of 19th-century dog portraits. Five years later, after a corrosive battle over her $130 million estate, Sotheby’s will auction 901 lots of furnishings, decorative art, fine art and jewelry on Sept. 24 and 25, to support causes Mrs. Astor championed during her life, like the New York Public Library, the Metropolitan Museum of Art, Historic Hudson Valley and the Animal Medical Center. 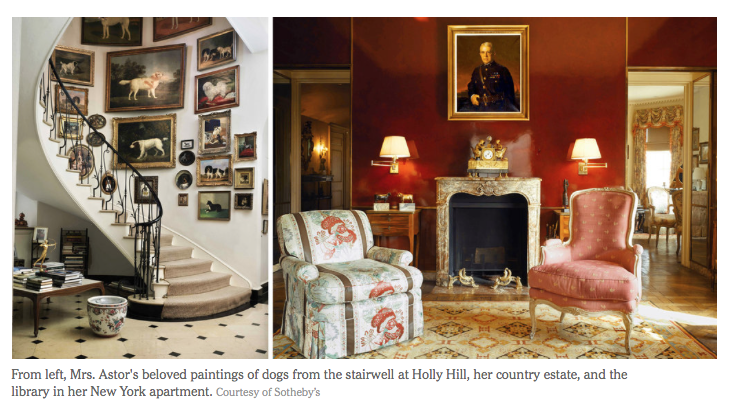 The lavishly illustrated Sotheby’s catalog offers a glimpse of the genteel splendor in which Mrs. Astor lived at Holly Hill and at 778 Park Avenue, and sets the scene for the alleged depredations of her twilight years. For the library, Mrs. Astor turned to Albert Hadley, Mrs. Parish’s business partner, who created one of the most admired interiors of the 20th century: a red-lacquered, brass-trimmed sanctuary that reflected Mrs. Astor’s starring role in reviving the fortunes of the New York Public Library. The room showcased leather-bound books that had belonged to Mr. Astor, the real-estate tycoon to whom she was married for more than five years before his death in 1959. And amid the chintz and gilded Buddhas, it was festooned with animal figures, a fanciful circus that included a carved-ivory Indian elephant studded with rubies and emeralds from Van Cleef & Arpels (lot 82, $6,000 to $8,000) and a Chinese gilt-bronze figure of a recumbent buffalo (part of lot 44, $2,000 to $3,000). Devoted to her dachshunds, Boysie and Girlsie, she took playful delight in sharing her love of dogs in particular. “She was a great hostess, fun and lively,” she added. After dining on Astor plates and monogrammed silver, guests would repair to the drawing room for coffee, where they could sit on Louis XV chairs festooned with floral chintz (lot 122, a set of four, estimated to fetch $12,000 to $18,000), amid old master drawings by Tiepolo and Boucher, and a Canaletto that once belonged to the Duc de Talleyrand (lot 143, $300,000 to $500,000). Mrs. Astor was also a prodigious accumulator of teapots: there are 46 from her collection in the Sotheby’s sale. In addition to more conventional shapes, there is a pair of Qing dynasty cockerels (lot 470, $8,000 to $12,000), a 19th-century cabbage-form vessel with a snake spout and handle (included in lot 502, $9,000 to $15,000), a Staffordshire glazed stoneware squirrel teapot (lot 247, $4,000 to $6,000) and a matching camel (lot 248, $2,000 to $3,000). FRIENDS of Mrs. Astor’s who visited in later years sometimes found themselves having to decline gifts from a bewildered lady who had trouble remembering their names. John N. Hart Jr., a film and theater producer, recalled that on one visit to Holly Hill, he paused to admire a Cecil Beaton watercolor, “Portrait of Brooke Astor,” that hung in her bedroom (lot 707, $2,000 to $4,000). Mr. Marshall seems not to have shared the same compunction about his mother’s possessions. After he fired Mr. Ely in 2005, the concerned butler kept in touch with her nurses and staff to check on Mrs. Astor’s condition, and learned that the Marshalls had been removing antiques, silver and other valuables from Holly Hill without her consent. He took his concerns to her grandson, who filed the lawsuit requesting that his father be removed as Mrs. Astor’s legal guardian and replaced by her closest friend, Annette de la Renta, and JPMorgan Chase & Company as co-guardians. When the court appointed them, Mrs. de la Renta rehired Mr. Ely as the butler at Holly Hill. On his return in July 2006, he was astonished to see how much was missing. In October 2006, in a civil settlement, Mr. Marshall and his wife, Charlene, were required to return more than $11 million in assets, including cash, jewelry and art, to Mrs. Astor’s estate. And on March 28, 2012, under the terms of a settlement announced by Attorney General Eric T. Schneiderman, Mr. Marshall relinquished his rights to furniture, household effects and books he had inherited from his mother. A selection of those items, along with fine art and jewelry that Mrs. Astor had earmarked for charity, will be available at the Sotheby’s auction. David Rockefeller, 97, a longtime friend of Mrs. Astor, said he welcomed the prospect of the coming sale. “I couldn’t be happier that the sale of these items will benefit several of the wonderful charities to which she devoted her life’s work and about which she cared so passionately,” Mr. Rockefeller said.